1. St Alfred the Great ... have you ever met him? Liturgy and Worship(1932), commenting on the abortive 1928 Anglican Prayer Book, says 'No precedent for including in a Calendar of Saints ... The proposed insertion of Alfred may be ... showing a desire for (quasi-)canonisation on the part of the post-Reformation Church of England'. Common Worship now authorises him on October 26. I was therefore amazed to find this 'saint' also accorded an optional memorial on October 26 by the local calendar (2002) of the Roman Catholic diocese of Northampton. Comments?!? Implications? 2. We are told that the Holy Father is going to revise the Good Friday prayer for the Jews in the 1962 Missal. Since a pope wrote that prayer, it can hardly (whatever SSPX may say) be beyond the competence of a pope to rewrite it. And because of ecumenical tactfulness the term 'blindness' (obcaecatione) has long been regarded with suspicion. But there do seem to me to be big questions here. It is definitely the teaching of the NT that Jews who do not accept Christ are blinded (Romans 11:25; Ephesians 4:18(caecitatem); and see 2 Corinthians 3:7-18). Do critics of traditional liturgy dislike it because, as they sometimes seem to say, it is insufficiently biblical, or because it is too biblical? I think we should be told. 3. My post on liturgical confusions ... last night I went to the very decent Evensong they do at the Oxford Oratory ... all from the old breviary; so that, for example, it being Sexagesima, we did not say alleluia after the opening versicles. But the celebrant wore green! And did I do very wrong to celebrate in S Thomas's on Monday morning an extraordinary form Mass ... but of S Thomas Aquinas? Is the question of Calendar for birituals not a priority for the Ecclesia Dei Commission? 5. Gregory of Langres knows he's got it wrong (http://massinformation.blogspot.com/). It is wearing a maniple that kills kittens. A pity Alcuin Reid forgot to mention this in his revision of The Ceremonies of the Roman Rite. I am redrafting the Latin vesting prayer said while donning the maniple so that all will be clear for future generations of neo-ordinati. I suspect I am not the only priest now with a calendar problem; not least since the motu proprio. Take the Gesimas; these Sundays have lovely masses, all of them; Septuagesima has its papal statio at S Lawrence; Sexagesima at S Paul; Quinquagesima at S Peter. (There is a fun game anyone can play; look through the old masses in the old Roman Missal or in the Book of Common Prayer and try to spot covert allusions to these Saints in the details of the texts.) Scholars are not agreed who composed the Masses concerned; was it S Gregory the Great or a predecessor of his in the previous generation? But whoever is responsible, we clearly have here a coherent liturgical season in which, faced with tribulations internal and external (including barbarian invasions; again, it is fun to spot references to Affliction in the texts) the people of Rome led by their pontiff trooped along the continuous porticoes which lined their streets to visit, on the edge of the old City, the three great basilicas of the City's three great patrons to seek succour in tribulation. We have tribulations enough in our time; perhaps these Masses do deserve to be dusted off and brought back into use. The problem? Well, are we really to bury Alleluia on the eve of Septuagesima? To tell the organist not to schedule hymns with A-word until Easter? To tell the sacristan to put away the green vestments? We can do this if the old calendar is the only calendar followed in the particular church. But what if some masses there are old usage (John XXIII or Thomas Cranmer) and others are new (Paul VI or Common Worship)? Similar probems occur throughout the year. For example, if I celebrate a P6 mass on January 13, I will observe S Hilary. If the following day pastoral imperatives or personal preference incline me to say a J23 Mass, I will find myself again 'doing' S Hilary ... because that rite displaced him from the 13th so that he did not collide with the Octave of Epiphany. But such duplication hardly seems very tidy. What solution should the Ecclesia Dei Commission make available? Anglicans have had a problem like this for generations; now that Rome has it too, perhaps we might get an answer! 'Gallows were set up upon the top of the tower of the parish church and all things being ready the vicar was brought to the place and by a rope about his middle drawn up to the top of the tower and there in chains hanged in his popish apparel and having a water bucket, a sprinkler, a sacring bell, a rosary, and other such popish trash hanged about him; and there, with the same about him, remained a long time; he very patiently took his death'. Here in Oxford much has been made of those who suffered for the Protestant religion under Queen Mary; and the Roman Catholics have very properly celebrated their own martyrs, including Bl George Napier, who bore witness at the Castle which is within our parish of S Thomas. Largely forgotten are those members of the Church of England who were executed - without trial - in 1549 because they would not accept the newly state-imposed protestant worship. On July 9 Lord Gray (an impoverished nobleman, known for his ferocity, who harnessed his diminished fortunes to the new religion) ordered the execution four Oxfordshire clergy: Fr Richard Tompson, Vicar of Dunstew; Fr Henry Matthew, Vicar of Deddington; Fr Henry Joyes, Vicar of Chipping Norton; and Fr John Wade, Vicar of Bloxham. It was specified that the last two should be hanged from their steeples. Laymen also suffered: John White; John Brookyns; William Boolar; Richard Whittington; (?)Bowldry. Executions were to be spread around Oxford, Banbury, Deddington, Islip, Wattlington, Thame, and Bicester 'for the more terror of the said evil people'. What has not always been noticed is that the 'order' describes this as 'further execution to be done'; in other words, this list is only the tip of an iceberg. Lord Gray then hurried down to Devon and Cornwall to join Lord Russell (whose fortune, still enjoyed by his descendants the Dukes of Bedford, was based on murder and the spoliation of the Church) in suppressing the better-known 'Western Rebellion', spectacularly recalled in Eamon Duffy's Voices of Morebath. The scale of the slaughters there have elicited the word 'genocide'. The description which starts this piece decribes the execution of the Vicar of S Thomas the Martyr, Exeter. These were our Catholic Anglican martyrs; two of them had accepted institution from the schismatic first bishop of Oxford, occupant of a see erected by Henry VIII. Like us, they undoubtedly resented the schism in which their 'betters' had involved them; their fellow-rebels in Devon significantly included in their demands the appointment of the exiled Cardinal Pole to be First in the Privy Council. But like us, they struggled for Catholic worship and for unity with the See of Peter from within the church of their birth and baptism. I think they should not go uncommemorated. Would anybody like to suggest how we might liturgically commemorate them here in S Thomas's? Traditionalist Roman Catholics sometimes tend to dismiss Ecumenism as a game only for trendies and liberals. I beseech them to realise that there is Ecumenism, and there is Ecumenism. Ecumenism, in my view, certainly does not mean cosying up to the Trautmans (Trautmen? Trautpersons?) with their apparent message of dumping the Great Tradition so as to be indistinguishable liturgically or doctrinally from liberal Protestantism. Longum abest quin ... And in this matter of Mass-versus-whatever, the academic groundwork was done by our fathers of the Catholic Revival in the Church of England 150 years ago; at a time when (I won't bore you with the reasons) the Anglican custom was to stand at the North End of the altar. The Tractarians demonstrated that the custom of ancient Christendom was to face East. In the 1970s versus populum took over the RC Church, and unfortunately quite a lot of Catholic Anglicans slavishly followed the flawed notion that this had been proved to be 'primitive'. But one of the first scholars to call out that this particular emperor had no clothes was the distinguished Exeter liturgist Fr Michael Moreton in a 1982 paper (read at the Oxford Patristic Conference and published in its papers) called Eis Anatolas Blepsate: Orientation as a Liturgical Principle. This was a couple of decades before Fr Lang of the Brompton Oratory wrote his deservedly best-selling book with the same message. 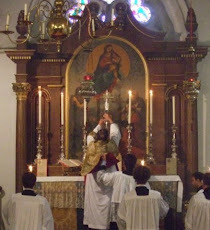 Fr Moreton is still going strong; last year he celebrated his ninetieth birthday and many of us felt close to tears as this much-loved figure, facing ad Orientem, slowly and with immense reverence uttered the venerable words of the ancient Canon Romanus. That's what I call real Ecumenism. Should the Lord's Prayer (LP) be modernized? It is, of course, translations that we are considering; Common Worship and ICEL each offer (different) new versions of the original Greek, neither, incidentally, bold enough anyway to satisfy modem scholarly opinion about the meaning of the original. Rome says a firm No; ordinary people can say the old form even when semiconscious! And Rome has a policy aim here; to maintain continuities and prevent modern committee liturgists from slicing through the collective memories that link different generations. Worship, in Rome's view, is not something to be constantly and abruptly Improved by Experts. The Roman pendulum has now swung very firmly back to the principle enunciated by Vatican II and then promptly forgotten by those who claimed to be enacting the Council's wishes: liturgies should evolve organically. "For thine is the kingdom, the power, and the glory, for ever and ever, Amen" (the Doxology). The C of E and its cultural derivatives in English Protestantism stand alone in treating these words as part of the LP. Modern textual critics have no doubt that they formed no part of the original text of the Gospels. And the worshipping tradition of the Church has not usually regarded them as part of LP. In the Byzantine Rite, the people say LP and the priest then 'caps' it with the Doxology, in a Trinitarian version (For thine is the kingdom, the power, and the glory, of the Father and of the Son and of the Holy Spirit, now and for ever and world without end). In the Roman Rite the Doxology was originally unknown, LP was followed by an elaboration of its final clause (Deliver us Lord, we beseech thee from all evils ... ), known as the Embolism, and said by the priest alone. After Vatican II this prayer was abbreviated and eschatologized; and, at its conclusion, the people (not priest and people together) acclaim (ICEL gives a modem translation) the Doxology. In BCP the shorter form of LP is normal, although in services in which LP occurs twice, one of them is in the longer form. Common Worship, curiously, flies in the face both of modern Biblical scholarship and of liturgical tradition by attempting to persuade us to use the longer form, the one with the Doxology, on all occasions.